Notes to the Chart for Rainbow Wand Consecration a. The number refers to the order in which the invocations are performed. b. The color refers to the band of color on the Rainbow Wand which you hold while doing each invocation. c. Tool indicates the elemental tool in the right hand for each invocation. d. YHVH shows the permutations of the holy Tetragrammaton. The source of these permutations is the Sepher Yetzirah, and they are directly related to the astrological signs. Each "Y" is pronounced Yud; each "H" is pronounced Heh; each "V" is pronounced Vahv. e. The names of the Hebrew tribes and the appropriate angel are fairly clear. Remember, "Ch" sounds like the German "ach." f. It will probably be easiest to make up 12 cards, each with the appropriate words filled in, for doing the 12 invocations so far in this ritual. g. Remember to turn one number on the "clock" for each invocation. language, I ascribe the letter HEH to which is alloted the symbolic tribe of GAD and over which is the angel MEL-CHJDAEL, to bestow this present day and hour, and confirm their mystic and potent influence upon the RED band of this Rainbow Wand, which I hereby dedicate to purity and to occult work. May my grasp upon it strengthen me in the work of the nature and attributes of ARIES. STEP THREE Now, visualize the forces of the nature of Aries descending from all around you onto the Rainbow Wand. When you sense this has occurred, or after three minutes, replace the Fire Wand on the altar (Consult any basic book on astrology for more on the qualities of the signs). STEP FOUR. Move your left hand down to the next stripe of color on the Rainbow Wand. It is red-orange. Turn to face the direction of the number one on the face of the imaginary clock upon which you stand. Take the appropriate elemental weapon according to the list on page 263. Now repeat the invocation from Step Two. However, change the capitalized words for the appropriate words from the list on page 263. Oh great Goddess of the forces of nature, great one who has been known by a thousand-thousand names since before remembered time, let thy influence descend and consecrate this Rainbow Wand which I dedicate to thee for the performance of the works of the Magick of Light.
. STEP SIX. Wrap your charged and consecrated Rainbow Wand in the silk or cotton cloth which you have for this purpose. From this moment on do not allow anyone else to touch it. Do not unwrap it except when you are going to need it for magickal purposes. Should someone else handle it, it would be a good idea to re-do this entire ritual. STEP SEVEN. Now close this ritual by doing the Closing by Watchtower, Steps Fifteen through Twenty of the Watchtower Ritual. Your Rainbow Wand is now ready for magickal usage. Take a while and make sure that you have the time to do the above ritual correctly. Do not rush it. Also, do not go on to the next section until you have prepared your Rainbow Wand as above, for the next part of the lesson uses the consecrated and empowered Rainbow Wand to charge and consecrate your magickal tools. 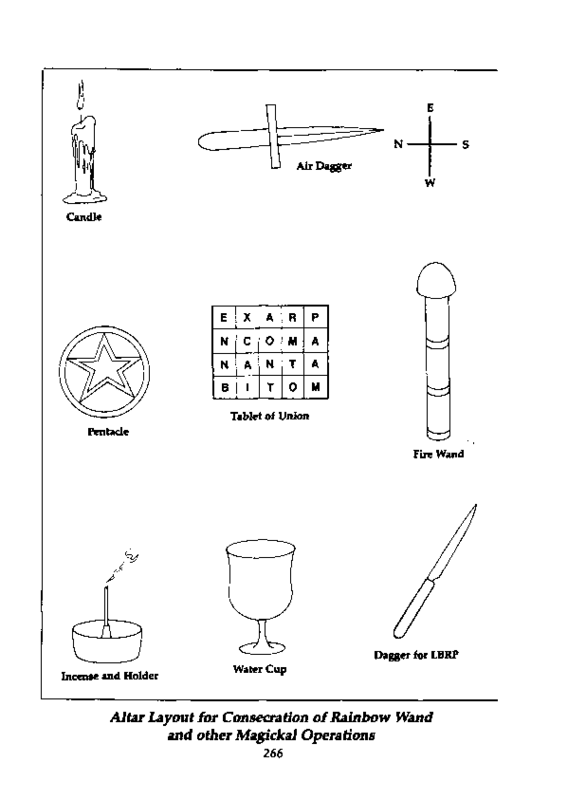 On page 266 you will find a diagram of the altar layout for the Consecration of the Rainbow Wand Ritual. 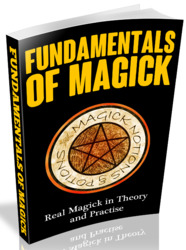 You will usually have the elemental tools or weapons placed in the same positions for all magickal rituals. The Dagger should be to the East; the Wand to the South, the Cup to the West; the Pentacle to the North. Candles should preferably be in the color of their quadrant (yellow to the East, red to the South, blue to the West and black, brown or green to the North), or else white.